Landowners along the old Rock Island rail line wanted answers. State Rep. Tom Hurst assembled a collection of people knowledgeable about trail development on Thursday in Westphalia to answer their question. How much is this trail going to cost tax payers? Where will the funds come from? How will this impact future plans for landowners? Many of these questions were asked during an two-hour long open meeting called by Hurst at the Westphalia Knights of Columbus. An estimated 250 attended to discuss a proposed rails-to-trails plan to rail bank 145-miles of rail bed from Beaufort to Windsor and turn it into a hiking and biking trail. Read the rest of the article for a detailed summary of the information presented and comments from participants on different sides of the issue. The intersection where an MU visiting scholar was hit and killed Thursday night in Columbia is a busy area with no traffic light or crosswalk. Kui Zou was struck and killed by a car at Providence Road and Carter Lane. . . The accident, along with two other pedestrian accidents reported Thursday, prompted concerns within the social media community regarding road safety. . . . The speed limit along the stretch of Providence Road near Carter Lane is 55 mph despite the frequent number of traffic lights. In the area where the accident occurred, there is no stop light, but rather a left-hand turn lane for drivers turning east onto the outer road. MoBikeFed comment: This is an area surrounded by neighborhoods, apartment complexes, a major hotel, and schools. Why is the speed limit on any road running through this area 55MPH and why does it not have crosswalks and traffic lights at each intersection, to help pedestrians cross safely? Demolition crews detonated the northern portion of the Fairfax Bridge truss from the north bank to the Missouri levee at 11:45 a.m.
Crews are making way for a new span, which will be one bridge with multiple lanes and bike/pedestrian access. The new U.S. 69 Highway Bridge is scheduled to open in December 2016. A proposal to transform an abandoned rail corridor into a 145-mile, cross-state biking and hiking trail is drawing praise from outdoor enthusiasts and concerns from some landowners. If converted, the Missouri Rock Island Trail would stretch from Windsor in the western part of the state to the Franklin County town of Beaufort in the east while twice crossing the 236-mile Katy Trail, which is also a state park. Ordinances making it easier for some Carthage residents to travel via bicycle or on foot were advanced Tuesday night by the City Council. 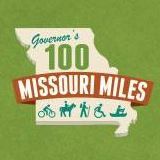 Council members gave final approval to an ordinance authorizing an agreement with the Missouri Department of Transportation to clear the way for a study that will determine which streets might lend themselves to designated bicycle lanes. The goal is a system of bicycle paths to make it easier for residents to reach schools, parks, shopping areas and local trails without the use of cars. . . . The council advanced on first reading an ordinance authorizing another agreement with the state Transportation Department to finance construction of sidewalks to connect three schools. The plan calls for construction of 3,575 feet of sidewalk along River Street between the Fifth and Sixth Grade Center and Fairview Elementary School, and another 3,950 feet of sidewalk on Pearl Street between Fairview Elementary and Carthage High School. Spectators will be able to view construction of a new Missouri River at Washington bridge up close from the Rotary Riverfront Trail under the latest proposal being discussed. The Missouri Department of Transportation will restrict workers to a 300-foot-wide work zone along the trail around the pier at the southern end of the current structure, members of the Washington Area Highway Transportation Committee were told Monday. Judy Wagner, MoDOT area engineer and a member of the committee, said citizens will be able to walk up to that point from both sides of the walking/bike trail, but won’t be allowed closer to the construction zone. MoBikeFed comment: The new bridge will include a separate bike/ped path that will connect the city of Washington with the Katy Trail. The bike/ped access across this bridge will make the final connection between the Rock Island Trail, which will end near Washington, and the Katy Trail, on the north side of the river from Washington, completing the 457-mile cross state trail loop the two trails will make. The death Sunday night of a third pedestrian since 1998 outside a Greek restaurant in St. Louis has prompted city officials to re-examine the intersection’s safety and traffic patterns. Candi McNeal, 45, of Brentwood, left the Olympia Kebob House and Taverna, at McCausland and Plateau avenues with her husband about 7 p.m. after dinner. Attorneys told a group of landowners Wednesday they will need to file suit quickly to get compensated if the Rock Island Trail moves forward. Many of the more than 1,200 landowners living along the corridor are upset that federal law lets railroads on their land get converted into recreational trails without any input from them. Meghan Largent, an attorney with the law firm Arent Fox, told Meta-area residents on Wednesday there is essentially no legal action that would block the trail conversion. Michael Burke will have to consume 36 pills a day and take breathing treatments with a miniature nebulizer. But that won't stop him from attempting to hike 230 miles on Missouri's Ozark Trail over 18 days next fall to raise awareness — and money — to find a cure for cystic fibrosis. MoDOT’s Multimodal Operations Director, Michelle Teel, testified before the Senate panel raising concerns about a dispute over new safety technology known as positive train control (PTC) that is required by federal law to be in place on all Class I railroads and other railroads carrying passengers by December 31, 2015. Amtrak recently notified the Kansas City Terminal Railway (KCT) of its intention to discontinue passenger service into and out of Kansas City starting next year if the matter is not resolved. Last year more than 737,000 people traveled on Amtrak in Missouri. McCaskill, along with fellow Missouri Senator Roy Blunt, is a lead sponsor of legislation to extend the deadline for implementing PTC by five years to December 31, 2020. The legislation will soon be reintroduced. An arrest has been made in a fatal accident involving a cyclist in Bridgeton nearly two weeks ago. . . . The accident happened around 5 p.m. Jan. 16 along Gallitan Lane near the intersection of Woodfordway Drive. The driver told police he topped a hill near the west end of the airport when he was blinded by the sun and struck 34-year-old Duane Johnson, who was riding a bike. When the accident happened, police said they didn't expect charges to be filed for the accident. MoBikeFed comment: Local cyclists who have inspected the seen say that it appears that the driver's story about being blinded by the sun is problematic and that the debris fields indicates that high speeds may have been involved. Without further investigation, it is impossible for us to know for certain what happened, but it appears that that there may have been more to the situation than originally reported. We applaud police for investigating these serious situations thoroughly and for pressing charges against dangerous and unsafe drivers where appropriate. Bridgeton police have arrested the driver who struck and killed a bicyclist on Jan. 16. Duane Johnson, 44, of the 3800 block of Brittany Circle in Bridgeton, was fatally struck by a pickup on Gallatin Lane near Woodford Way Drive about 5 p.m. that Friday. Police arrested the 42-year-old driver on Tuesday on suspicion of second-degree involuntary manslaughter. Police continue to investigate the crash and have not yet sought charges from the St. Louis County prosecuting attorney.